This enormous vista was my reward for getting up to drive the remaining stretch of the Glenn Highway (to Glennallen) on less than three hours of sleep. In other words, I was the proverbial “early bird”. 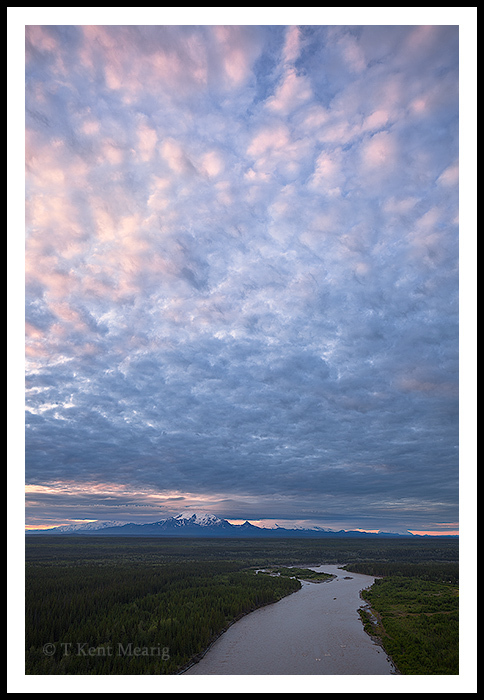 I stopped at a dirt lot on the side of the Richardson Highway (maybe 9 miles north of the Wrangell-St. Elias NP visitor’s center) that allowed access to a bluff overlooking the northeast part of the park. Portions of the four most prominent peaks in the Wrangell Range are visible in the photo, which really requires one to understand a little about what she or he is looking at to fully appreciate it.